As much as I hate Friday afternoon traffic, this seems to be the summer of weekend getaways. There is something so incredibly liberating about waking up Saturday morning, breathing in the fresh country air, and realizing you've managed to escape the chaos of the city for a few days. Prince Edward County was the perfect oasis -- rural farming landscapes as far as the eye can see, quaint little towns scattered along the main street, enough wineries to keep you busy and boozy, farmers markets to peruse and stock up on produce for the week, and sand dunes and beaches to frolic along. Though the weather didn't exactly facilitate beach time (15 degrees in August, really?! ), we did manage to indulge in everything else. Successful weekend indeed. 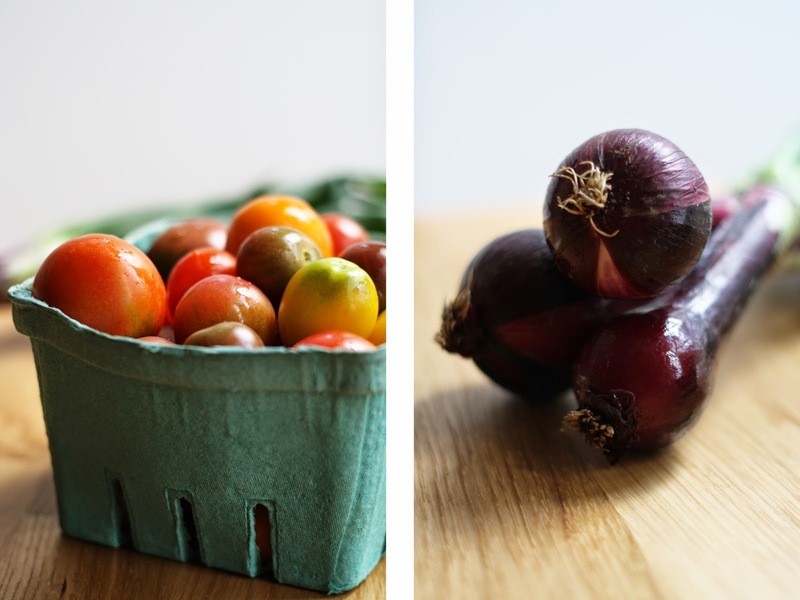 We picked up a whack of gorgeous summer produce, including these darling heirloom tomatoes and baby red onions. It's been cool enough this week to turn on the oven, so roasting the tomatoes seemed fitting. Naturally, salsa was the next step. Finely chop 2 of the tomatoes and set aside. Combine the halved tomatoes, chopped onion and 2 whole chiles in a bowl. Toss with 1 T olive oil, salt and pepper. Spread onto a tin foil lined baking sheet. Wrap the garlic in a tin foil packet and add it to the baking sheet. Broil for 15-20 minutes until the edges of the veggies are charred, but the tomatoes haven't fully burst. Remove from oven and let cool. Remove the stems from the chiles, and push the garlic out of their shells. Transfer to the body of a food processor fitted with the s-blade. Add the roasted vegetables, and pulse until pureed (duration of pulsing based on your desired consistency of salsa). Transfer to a large bowl, add the chopped tomato, cilantro, salt (to taste) and juice from 1 lime.